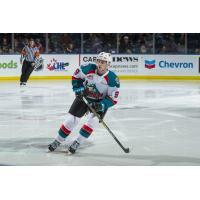 The Kelowna Rockets will be without forward Mark Liwiski for the next three games. The Western Hockey League announced today that Liwiski has been suspended three games for the boarding and major he received during Sunday's game on March 3rd against the Portland Winterhawks. Liwiski will serve the first game of his suspension on Friday, March 8th at Kamloops and will be eligible to return to the Rockets lineup on Friday, March 15th at Vancouver. The Rockets continue their playoff push this Friday when they head to Kamloops to face the Blazers. They'll return home to host the Blazers on Saturday night for the 'RE/MAX Presents: Rockets Suit Up with Don Cherry to Promote Organ Donation' game. There is a new Don Cherry bobblehead this season and specially themed jerseys that will be up for auction. Tickets are on sale at selectyourtickets.com, at the Prospera Place box office or by phone at 250-762-5050.